Come ‘on now don’t give me that look, when its about special occasions here in our country we do love to go the royal way and what could be better than Mughali for the upcoming Rakhi celebration on the 2nd. Mughlai cooking as we know is all about rich, spicy and delicate cooking which produces food that simply melts in our mouth. 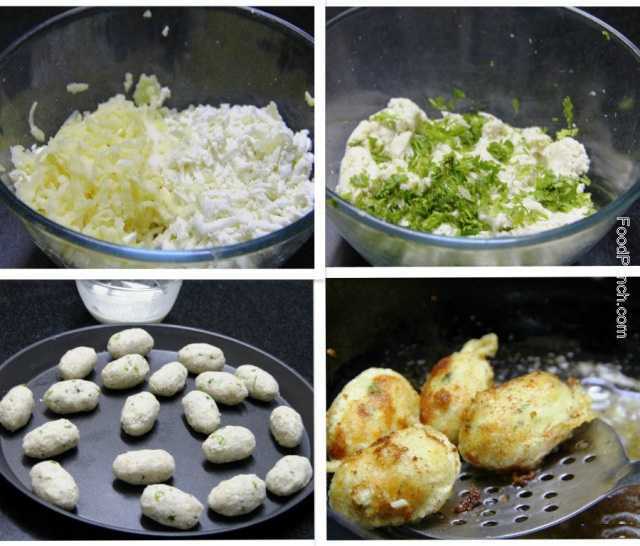 Hence, a test batch of these divine Malai Kofta’s for my Saturday Dinner would allow me to share the recipe with you much before the actual festival, so there’s enough time to arrange the ingredients and plan your special Festival feast. Et voila! Am I not getting better each day with my excuses for indulgence? Well whatever, if too wish to join me in the crime of indulgence with food, try the recipe, here it goes. 2 large boiled potatoes, or approx 1 cup mashed potatoes. Grate panner and boiled potatoes over the larger hole of the garter into a mixing bowl. Add salt to taste, the garam masala powder, pepper and mash together to make smooth dough. While adding salt just add a little for the koftas will go into the gravy later on. Then add chopped coriander, bread crumbs and green chillies and mix well. Divide the dough into equal sizes and make small koftas. You can make them round or oval as you prefer by rubbing some oil on your palm. Now size and shape of the kofta will decide how much oil you require for frying. Heat enough oil so that the koftas completely submerge in it. Mix all purpose flour and water to make a batter, Dip each kofta in the batter and deep fry until evenly golden brown on all side. Strain koftas on a kitchen tissue towel and keep aside. Heat ghee in a non stick deep skillet or wok. Add the bay leaf, cumin seeds, asafoetida and the cinnamon stick to the oil. Once the aroma develops add in the ginger garlic paste and give a stir, then add the boiled onion paste and fry for 2-3 minutes on medium flame. 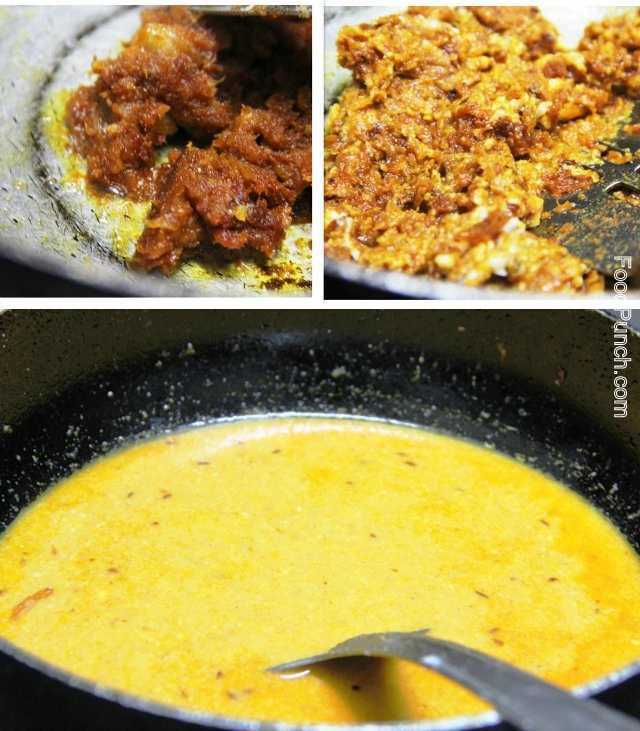 Now add turmeric powder, hot red chilli powder, coriander powder and a few pinches of salt and fry the mixture till oil starts oozing out at the edges. Then add the pureed tomatoes and kashmiri mirch /paprika powder and fry till the liquid has dried up and oil stars appearing at the edges. You must keep stirring continuously to avoid the spices from burning. Now stir in the cashew nuts paste and fry for only 30 secs -1 min. Add 3 cups of water stir well and allow to simmer cook till the gravy has thickened and attained the required thick consistency. Turn off the gas and add the garam masala powder. 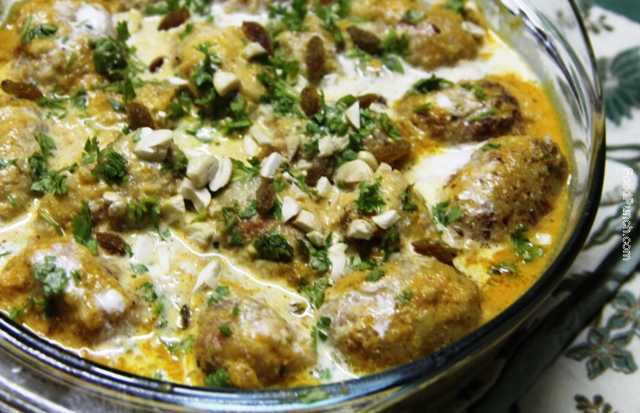 Add koftas just before serving as they are soft and would melt away if added beforehand. 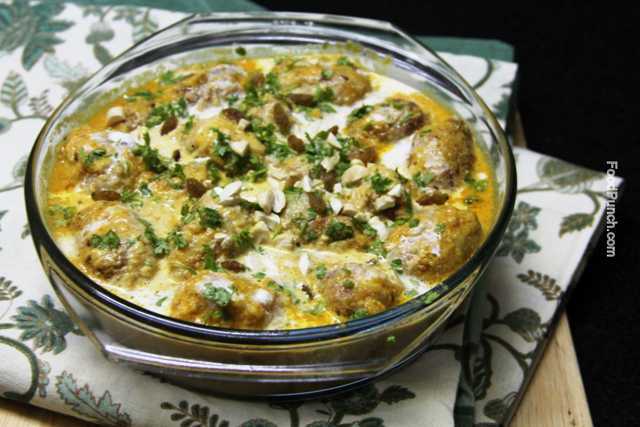 To serve, spread malai koftas in the serving dish, warm up the curry and pour over the koftas. Stir in the entire cream, dress up with fresh coriander, chopped cashew nuts and raisns and serve hot with your choice of bread. You may add the cream beforehand in the curry before removing from the flame. Adding it at the end simply adds glamour to the presentation. Do heat the oil for deep frying slowly and not in one go at high flame. Do add extra chillies or spices to suit your taste, although malai curry is never made spicy it’s a savoury and sweet curry with the taste of cashew nuts intact. Do not add the koftas to the gravy and cook. Just drop them in to the warm gravy serving. Do not fry the spice mixture for long after adding the cashew paste as it tends to lose the flavour and burns very fast.